For the 1989 DOS port of Bubble Bobble, see Bubble Bobble. Compilation of Bubble Bobble and Rainbow Islands, with a new DOS port of Bubble Bobble and Rainbow Islands receiving an official DOS port. 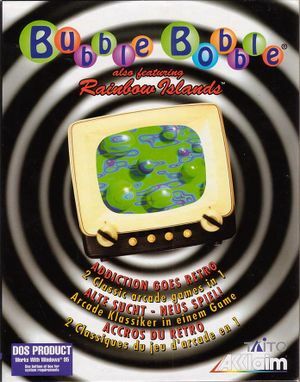 Both games featured in the collection are not exactly arcade-accurate ports like they claim to be, leading to minor inaccuracies in Bubble Bobble, and the secret islands missing entirely in Rainbow Islands. The music in Rainbow Islands is altered due to licensing issues. Besides sound card configuration files, this game does not save any data. Supports standard joysticks, and natively supports the Gravis PC Gamepad. Need to use keyboard to select game, exit current game, and activate controller. This page was last edited on 14 April 2019, at 13:11.